Is it really cheating if your spouse approves your infidelity? Max von Essen and Elisabeth Gray in Yours Unfaithfully by Miles Malleson. Photo © Richard Termine. Exploring the conventions of marriage and the humbug of monogamy, Miles Malleson wrote and published Yours Unfaithfully in 1933. Mint Theater Company is giving this charming and disarming comedy/drama a premiere showing through February 18th, under the direction of Jonathon Bank. For this discovery, we owe them a great thanks. Stephen Meredith (Max von Essen) is blissfully enjoying his wife’s beneficence. Anne (Elisabeth Gray) has given her blessing for him to “get into some mischief” with Diana Streathfield (Mikaela Izquierdo) in the hope that an affair would rejuvenate Stephen and end his writer’s block. Neither she nor Stephen imagine any other consequence. They are acting on their convictions that a strong marriage can withstand other and lesser alliances, just as Stephen’s father, the Rev. Meredith (Stephen Schnetzer) acts on his principles when he is shocked to learn of Stephen and Diana’s dalliance. Anne’s confidant and the Merediths’ friend, Dr. Alan Kirby (Todd Cerveris) preaches the counterbalance of the head to the heart. The brilliantly deft production of Yours Unfaithfully is a welcome addition to the Mint archive. As is customary in a Mint production, sets and costumes have a panache as well. The scenic (by Carolyn Mraz) and costume (by Hunter Kaczorowski) design are admirable. The top-notch ensemble brings Malleson’s smart vision to life with an easy flair. It’s a tribute to all involved that one can’t peg Yours Unfaithfully as drama, or drawing-room comedy; it transcends labels and stands on its own. For more information and tickets, please visit the Mint website. Okay, so now as Phantom approaches its 12,000 performance at the Majestic on November 28th, it is time to visit (or perhaps re-visit) this record-breaking musical. After January 26, 2017, as it enters its 29th year on Broadway, Phantom of the Opera becomes an event, a go-to destination, a bright fixture. You get the picture. Go, see James Barbour in the lead role opposite Ali Ewoldt as Christine Danae, and welcome the returns of Kaley Ann Voorhees as the Christine alternative, and Linda Balgord as Madame Giry in the new year. Phantom has broken records before, of course, in January 26, 2013, it was the first show to celebrate 25 years on the stage. It became the longest-running show in Broadway history on January 9, 2006 with its 7,486th performance, surpassing the previous record-holder Cats, also by Andrew Lloyd Webber and also produced by Cameron Mackintosh. Since breaking the record 11 years ago, Phantom has played more than 4,500 performances – which by itself would be a smash hit run for a Broadway musical. To put this in perspective, sort of, note that Broadway’s second longest-running show, Chicago (in revival) has played for just 20 years. 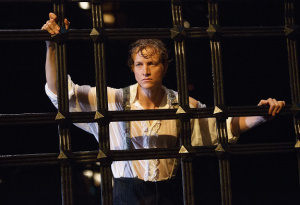 Phantom has had the curtain fall on 4,000 more shows than Chicago over the years. 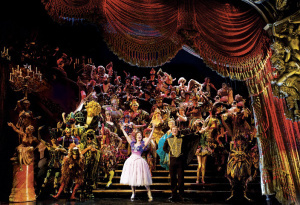 Even now, it is consistently among Broadway’s highest-grossing shows and remains a box office star. Phantom also plays to the world, and its productions around the globe have been enjoyed by a staggering 140 million people in 35 countries and 160 cities in 15 languages. As we said, its an event! After 11,000 performances, a musical drama could be forgiven if it began to show some wear. In theater time, a run of more than 25 years is a very long lifetime. The Company in “Masquerade” in a photo by Matthew Murphy. The Phantom of the Opera, in its 27th year on Broadway, at the Majestic Theatre, hasn’t aged, or rather it has aged well. This is not a show resting on its laurels. Or on its worldwide success in tours all over the US, in Stockholm or Budapest or Istanbul, among the many places it has found a home. Despite the myriad other accomplishments of his career, Phantom may prove to be Andrew Lloyd Webber’s crowning legacy. It was a breakout hit from its opening night at the Majestic in 1988, where it walked away with 7 Tony Awards, including for Best Musical, Design and Direction. Those who crave the spotlight most often become entertainers. Their talent demands it. It is their calling to shine. We applaud them, and in so doing bask in the glow of their accomplishment. They are center stage with the footlights on them, but we are illuminated by their performance. Their light shines on us as they render and interpret and presnet their truths. Greater performers shine brightest, and we shine brighter too.